Perfect Grilled Pork Chops are actually really easy to make. Choose the right cut, add some seasoning, and grill the best pork chop you’ve ever had in your life! These pork chops are magical! They rival any beef steak. Every time I make them people rave that they are the best pork chops they’ve ever had in their life. Follow my instructions and you will be the star of every backyard barbecue! People can’t get enough of my perfect pork chops. 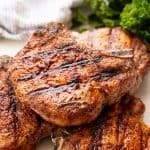 What is the best cut of meat for grilled pork chops? There are four different cuts of pork chops. The most preferable is the center cut rib chop. Rib Chop: This is the most desirable cut of pork chop. It comes from the rib section (hence its name) and has a large bone running along one side. This cut is very tender with a nice pork flavor. Loin Chop: This pork chop cut has a t-bone in the middle. It has two different kinds of meat on it, with loin meat on one side, and tenderloin meat on the other side. These two meats cook at different rates so it is a more difficult cut to work with. Boneless Chop: This is the most lean cut of pork. It is very easy to over cook this cut and dry it out as it has very little fat, connective tissue, and doesn’t have any bones. 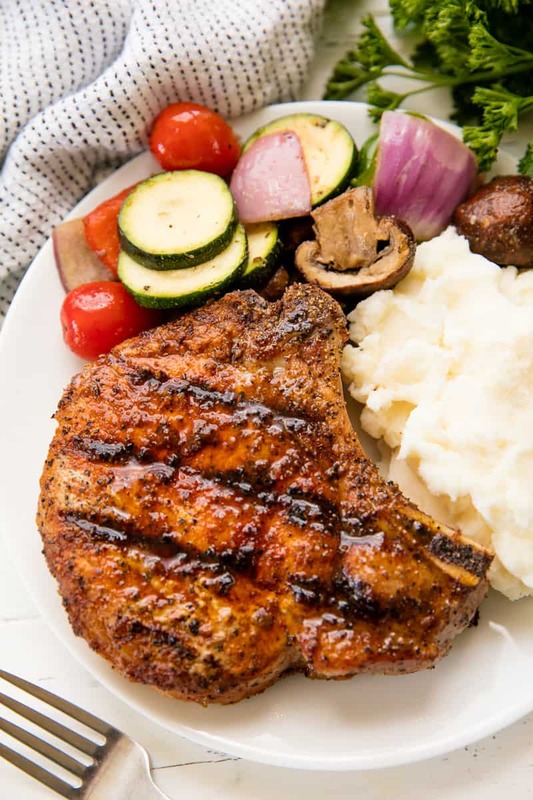 This is the most commonly sold pork chop cut in the United States, but it is certainly not the most desirable because it is lean, and so easy to overcook. Shoulder Chop: This is the least desirable cut of pork chop and is not commonly found in American grocery stores. They have lots of flavor, but also have a lot of gristle and bones. This cut of chop is best braised. What kind of pork chops should I buy for grilling? Bone in pork chops are the best for grilling. You want to purchase a pork chop that is at least 1-inch thick to use on the grill. If you don’t see any out for purchase, you should ask at the meat counter and they can cut them for you. Ask for a 1 1/2 to 2 inch bone-in center cut rib chop or loin chop. Either of these will be a great option for the grill. 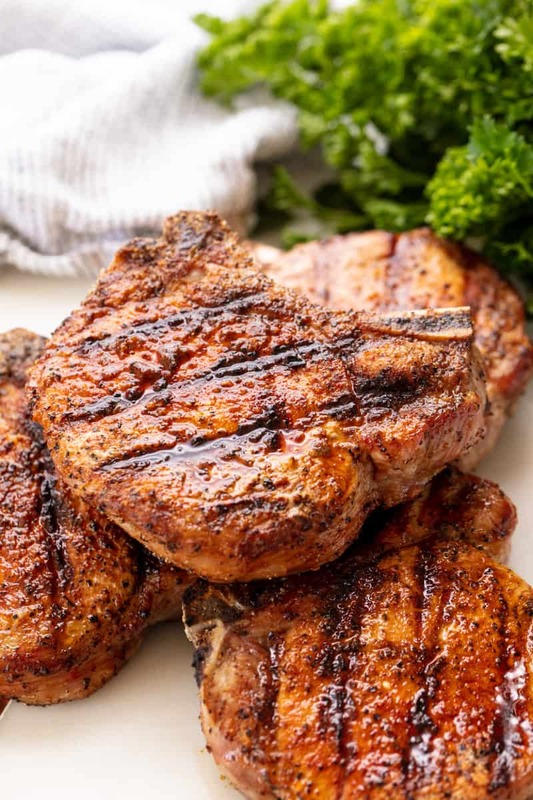 Perfect Grilled Pork Chops are actually really easy to make. Choose the right cut, add some seasoning, and grill the best pork chop you've ever had in your life! Heat an outdoor grill to high heat, about 500 degrees Fahrenheit. In a small bowl, stir together paprika, salt, and pepper. Sprinkle the mixture on each side of the pork chops and rub it in. Grill the chop by searing each side for 2 minutes over the high heat. Remove the chops to an upper rack or to a spot with indirect heat to finish cooking. Reduce the burners to medium, close the lid, and cook for about another 15 minutes more. Actual cooking time will depend on the heat of your grill and the thickness of your pork chop. Pork needs to be cooked to an internal temperature of 145 degrees Fahrenheit. I rarely post comments on anything, but these pork chops are the best I have ever had in my entire life!! I’m 60. I used boneless loin chops as that is all I had, they were from Sam’s and about 1 1/4″ thick. They were good! Super easy, I never cook, but my wife had surgery and needed something simple and quick. This was the perfect recipe. The kids enjoyed it as well.. These are the best pork chops I have ever tasted. My husband cleaned his plate. These are wonderful!! Didn’t have smoked paprika so googled the substitute which for the 2 tsp of smoked paprika substitute 1 tsp regular paprika and 1 tsp cumin. Delicious!!! These were moist and delicious and incredibly delicious! Best grilled pork chops I’ve ever made!! Grilled bone-in chops for the win!!! This recipe was easy to follow with minimal ingredients, prep and cook time. This grilled pork chops are the bomb!!!! My family just loves this recipe!!! So simple, so easy yet so delicious! The pork chops I used we pre-seasoned, but I used this cooking technique and they came out perfect!